It peeves me, it does, the dismissive tone that can be adopted by people when referring to the physical emphasis of yoga practice. Those lofty intellectuals view the yoga world as full of strutting Amazonians, balancing on one finger tip, mainlining green smoothies and taking nothing but their smooth rippled musculature as sacred. Now, of course, I exaggerate, but there is something in this tendency to view things as good or bad, right or wrong, black or white that I find deeply unsettling. In part it is due to this polarizing human habit that I find the physical aspect of yoga so relevant. If there’s something that we all share, it is our physicality. Beyond our views and our percentage of “spirituality” vs. “rationality”, our body is, in a sense, where we meet. Recently I have been re-discovering the work of Peter Levine. His insight into how humans cope with trauma presents a very interesting take on our seeming intelligence. The way our physical bodies store the imprint of stressful situations seems so outdated. Our frontal brains, driven by speed and constantly chasing after things, do little to consider the body’s own rhythm. Through the prism of the gunas this is clearly an imbalance of rajas. We see for example incredibly articulate, clever and sophisticated individuals paying scarce attention to their physical health. Our entire culture seems built on this precedent. It is only when we slow down that we begin to notice the body’s own intelligence as something quite otherworldly. Sensation has a lot to say. Āsana, the physical branch of yoga practice, the most widely practiced, the great storehouse of postures, is deeply beneficial. Āsana goes beyond words, it begins to introduce the medicine of meditation. In āsana the subtle shifts of attitude and mood transform one’s very consciousness. Beyond the gymnastic façade of certain āsanas is a very real encounter with our deepest attachments and fears. The tension we visit and steep in throughout our physical practice allows us to uncover that version of ourselves that is unfettered, that is beyond body. We go through body to go beyond body. Don’t diss the āsanas, but do please slow down. 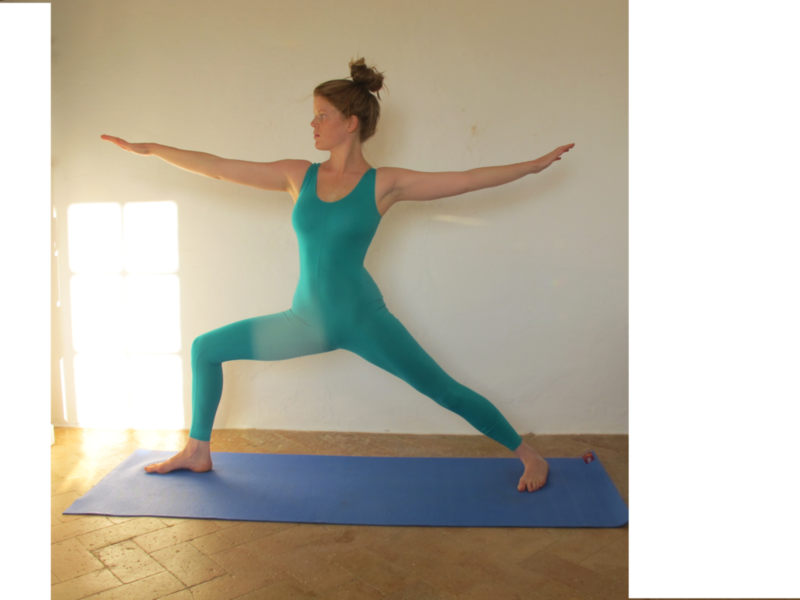 Asana focus: virabhadrāsana II workshop, at Yoga Akasha, 29th September, 12-2. Book through shop.